While they are rarely life-threatening, pet allergies can cause a variety of problems. Allergens, or whatever triggers an allergic reactions, are breathed in, eaten, or come into contact with the skin. The immune system tries to get rid of allergens, causing certain symptoms to occur. When people have allergies, we typically experience sneezing, coughing, watery eyes, and nasal drip that just won’t quit. Depending on the triggers, allergies in pets cause problems in the digestive tract, on the skin, or with respiration. Fleas are responsible for a lot of anguish. When they bite the skin of an animal, they leave behind trace amounts of saliva, which results in flea allergy dermatitis in some pets. Redness, swelling, and severely itchy skin are common outcomes, but secondary skin/ear infections and hotspots can happen, too. Pollen, grasses, dust mites, smoke, mold spores, certain fabrics, and dander all contribute to potential environmental pet allergies. Some animals are genetically predisposed to environmental allergies, but many develop them between 3 months and 6 years of age. Bleeding, raw skin and bald spots can occur on these itchy areas from persistent scratching and chewing. 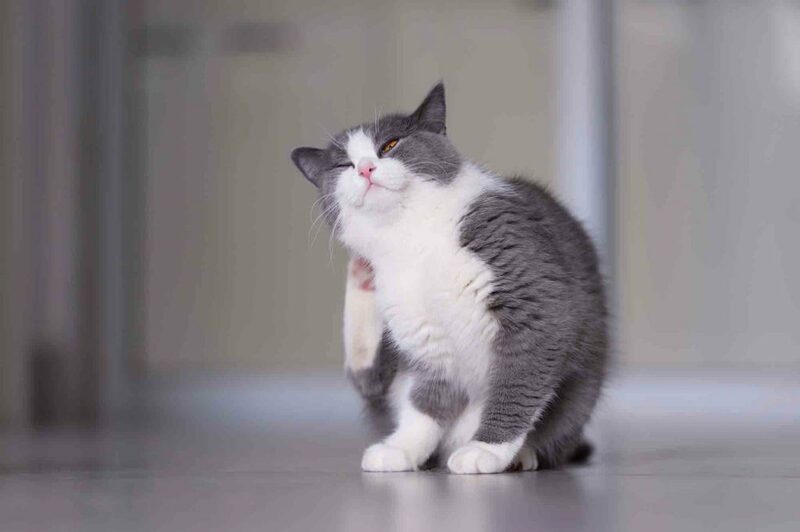 Like other allergies in pets, the immune system goes on high alert to target the allergen and the response typically affects the skin and gastrointestinal system. Eliminating possible triggers is a solid place to start managing food allergies in pets. We are happy to assist you during this process. It can take time to identify triggers in food. The good news is that we can take steps toward managing symptoms and providing comfort and relief. There are various medications and supplements that aid in the treatment of allergies in pets. While pets that suffer symptoms generally experience them throughout life, they can continue to live happy, active, and healthy lives. Identifying allergens as early as possible helps toward mitigating symptoms, and our staff are always here to answer questions or address concerns.